For most of January, I had the opportunity to extern at Commissioner Bailey's Office in Multnomah County doing public policy work related to housing and homelessness. Christine Lewis (an awesome former Reedie!) was my supervisor, but overall I got a lot of independence to go to meetings, conduct research and explore housing policy issues facing our county. Multnomah County is attempting to reduce their population of people experiencing homelessness by 50% in the next two years. By July 1st of this year, they are attempting to place 430 individuals in permanent supportive housing with all of the essentials a person needs to sustain their housing long-term. It is an exciting time. To go about this endeavor, Multnomah County meets with social service providers, government officials, community members and individuals currently and formerly experiencing homelessness to conduct a plan of action. I had the opportunity to sit in meetings with on-the-ground direct service providers, executive directors, policy-makers, commissioners and even Mayor Hales. Everyone I spoke to really cared about the issue of ending homelessness and were willing to put aside any differences to get the job done. One of the best parts was being part of conversations that were not only seeking to end homelessness, but prevent it. Everyone was willing to look at deep-rooted issues such as our education system, healthcare, criminal justice, foster care, the VA and more to better piece together the complexities that cause homelessness. There was also a lot of talk about what it took to help a person sustain their housing. We discussed strategies to work as a community to help individuals get employment, life-sustaining activities and better support members. Multnomah County not only wants housing for every individual, they also want a better life for every individual. My name is Florence Randari, an international freshman student from Kenya. I am a prospective Math Economics major planning to join Business School after Reed and start a career in the financial services field. Through the help of my career adviser, Brooke Hunter, I managed to get a winter externship with a non-profit organization called Our House of Portland, to learn more about running and managing of non-profits. 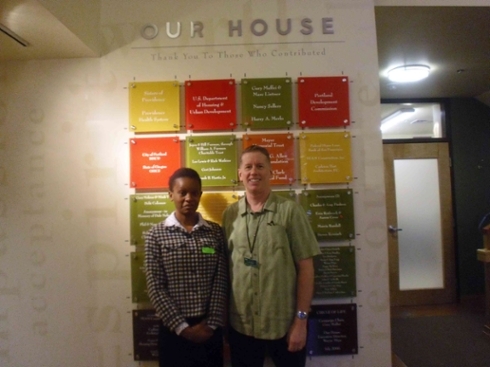 Our House of Portland is a non-profit organization that provides healthcare, housing and other vital services to low income people living with HIV/AIDS. My host was Allen Brady who is the Director of Business services in the organization. Allen took me through a detailed information session on how he manages the finances of the organization, writes a budget and prepares an Annual Financial Statement for the organization among other duties. Being a non-profit, I was interested in knowing how they get the large amounts of money to offer free services to the 14 clients in the Neighbourhood Housing and care program as well as provide food banks, clothing and household items to over 700 people living with HIV/AIDS. Although my externship at Crossroads Community Services was short, just four days, it was an extremely enriching experience. I saw the organization both from an administrative perspective by attending meetings, seeing how food for the soup kitchen, shelter, and pantry is acquired and organized, and how guests at the shelter are selected. I also took a volunteer's perspective, by participating in helping the shelter, soup kitchen, and pantry programs. Additionally, I was able to learn from my externship sponsor about the ins and outs of the shelter system in New York. I became aware of the factors that can lead to homelessness, and about some of the potential solutions. Crossroads Community Services consists of three different programs. The women's shelter gives up to ten women dinner and a warm place to sleep every single night. The food pantry acts somewhat like a grocery store with free items for families having trouble making ends meet. Their soup kitchen serves dinner to homeless individuals every night and serves a full, restaurant style breakfast on Mondays, Wednesdays, and Sundays. Additionally, the soup kitchen hands out coats and other donated goods before dinner some days. The three programs complement each other well, each providing vital resources to individuals in different situations of need. The three programs are able to support each other, because one often is able to make use of leftover or unused resources from another of the programs. My first experience was with the soup kitchen, working with other volunteers to go on what are called "food rescue missions”. These “missions” consist of picking up the day's unsold, leftover foods from stores and company cafeterias (CCS is in midtown. I had no idea that businesses were a source of food for soup kitchens, and found it really interesting and inspiring that for-profit companies were willing to be so generous. Also, the food we were able to scrounge up was really tasty! The guests who come to the soup kitchen for dinner every night really seemed to appreciate it.